This new topic will be available for you to post payment proofs. We will refer to this topic with our social media pages, we believe this will be beneficial for both our users and us, since it will be a space for users to find and refer to proof and will also help to boost our credibility even more. The best would be a screenshot of an email from your payment processor or screenshot from your payment processor. Payment proofs of all the processors are welcome, even Bitcoins ones, which we will add a screen from the share panel to confirm it was a cashout from MTV. We highly recommend to black-out any personal information such as mail, name, address, mainly for security reasons. Upload your screenshout by clicking on "Choose images"
Copy the link from the category "hot link for forums" (third from bottom) and paste it in this topic. Please feel free to start posting your payment proofs here! For your trouble, you will get 200 BAP, per cashout, if posted there. Don´t forget to post your payment proofs here! Get another payment: Thanks admin!!! Received Payment 6.36 USD f. Memo: API Payment. 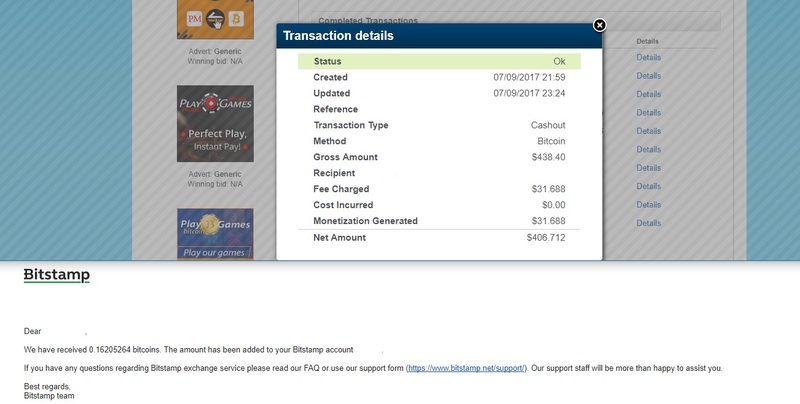 Hey, here is your cashout from the PaidVerts.com / MyTrafficValue.com, enjoy!. Hey charlie, sorry for the late reply. We made a post here at facebook, hope it is ok for you! 31$ fee.We should use ltc until things cool down with btc.The fees are incredible these days. Fees have been incredible high with btc lately. No problem, go ahead and use it! Thank you svetla for sharing with us your payment proof! Cash from the game can be cash out? ?